Billionaire fortunes grew by $2.5 billion a day last year as poorest saw their wealth fall –new Oxfam report. Quetta: Chief Minister Balochistan, Nawab Sanaullah Khan Zehri has said that Gwadar is a strong part of Balochistan and it will always remain part of Balochistan. “In order to address the apprehensions of local people of Gwadar of being converted into minority after development, legislation is being made in this connection,” he added. Chief Minister Balochistan expressed these views in a luncheon hosted by Balochistan Newspapers’ Editor Council in his hononur here on Wednesday. Chief Secretary Balochistan Saifullah Chattah and Senator Agha Shahbaz Durrani were also present on the occasion. Talking about the law and order, Chief Minister Balochistan said that without improving law and order the goals of development could not be achieved. “Government is not only cognizant about its responsibility but also taking effective actions against terrorists involved in the murder of innocent people and law enforcement agencies,” he added. “Everybody has constitutional right to live an independent life,” he observed, adding that being a Nawab it is my responsibility and duty to protect our masses. He said that our forefathers with the power of sword protected minorities and oppressed people for centuries and rendered sacrifices while members of my own family had embraced martyrdom for the people of Balochistan. 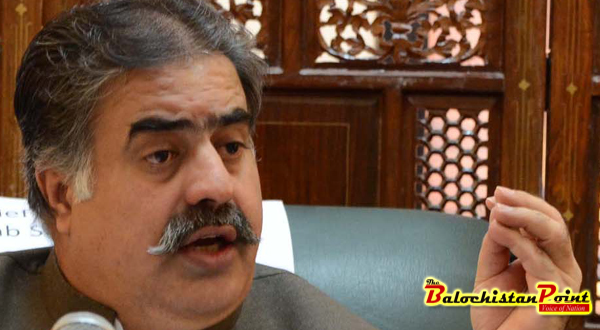 Chief Minister said that law and order situation of the province has improved, and for establishment of a peaceful Balochistan media should play its role and create awareness among the people and guide the government. He said that government besides improving law and order, it is also seriously focusing the process of development in the province especially improvement of Quetta city and provision of basic life amenities to the masses. The Balochistan Point is an online English newspaper from Balochistan, launched on October 16, 2010. The Balochistan Point is an online newspaper and works without any bias towards any race, religion or political ideology. The core values of The Balochistan Point shape up an independent editorial policy for the newspaper. We at The Balochistan Point believe on Objective Journalism and avoid any news item based upon allegation or speculations. Due to our indefatigable effort to disseminate the important and correct news about Balochistan, we aim to be the voice of the nation.